For many of us, our impression of a cruise experience stemmed from a smarmy sitcom in the 1970s and ’80s called The Love Boat, in which the likes of Charo, Donny Osmond and Lola Falana experienced relationship issues that Captain Stubing and Isaac, the ship’s only bartender, would resolve. 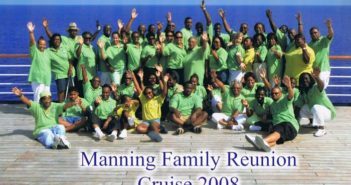 The reality is that there’s only one dilemma to deal with in planning a real reunion cruise circa 2007: which cruise line? To insure a great time, consider going “all aboard” these extraordinary floating resorts that cater to reunion groups in a big way. What comes to mind when you hear the words “Beautiful! Passionate! Italian?” Exactly: legendary Italian star, Sophia Loren, serves as godmother to MSC Cruises, a line that boasts Italian officers, Italian-inspired decor and hospitality, and the wonderful “La cucina Italiana,” a blend of old world family recipes and modern cuisine. Whether you choose a transatlantic journey, an excursion on the Mediterranean Sea or a Caribbean itinerary, expect the best of everything. “An MSC Cruises ship provides a venue that brings groups closer as they share what amounts to travel and a cultural experience that is truly ‘Beautiful. Passionate. Italian,'” explained Gail Nicolaus, Director, Marketing for MSC Cruises (USA), Inc. “High standard of onboard service and Italian cuisine, hospitality, design and sophisticated interiors are the cornerstone of the MSC Cruises philosophy â€” all aimed at giving guests personalized and impeccable service. Guests can participate in onboard activities and exciting shore excursions during the day and then reunite each evening to share experiences over dinner before enjoying European-style nightly entertainment in the theater or one of many lounges,” she added. MSC Cruises sails to the most gorgeous locales on the planet, and offers a variety of ship sizes, styles and personalities to match your groups’ needs. “Once the ship and itinerary are chosen, everything falls into place,” Nicolaus said. “Depending on your group size, travel agents can arrange for private parties onboard and tour guides on shore. We are quite flexible and work with each group to create a customized experience.” Check www.msccruisesusa.com for special offers such as two-for-one stateroom deals, discounts on some itineraries, theme cruises that allow you to meet some of the greatest baseball players, special baby boomer and senior fares, holiday sailings when kids sail for free and more. Call 800-666-9333 for a free brochure and start dreaming. The Discovery Day Cruise, featuring all the amenities of a longer cruise, is a nice option when time is of the essence. You enjoy award-winning meals, relaxing on the sun deck or swimming in the pool, dancing in the disco, all kinds of contests and games, casino, showrooms and lilting island music as your soundtrack. Departing at 7:45 AM and returning at 10PM, the Day Cruise allows for time on the island to shop, beach comb or try your luck at the Isle of Capri casino. Readers of Porthole Cruise Magazine chose Discovery Cruise Line as the “2006 Best One-Day Cruise” for the sixth consecutive year. Hosting an average of 150 reunions a year, Discovery Cruise Line offers meeting facilities, audio and visual equipment, reserved dining areas, special theme parties and menus, games and entertainment and even an open bar with coupons. “People select Discovery for a reunion because it can accommodate the group almost regardless of size, having a capacity of 1,200,” explained Discovery spokesperson, Larry Turner. “The party truly starts the moment you board; the food is spectacular and plentiful and the crew can tailor-make the trip to meet the group’s needs,” he added. 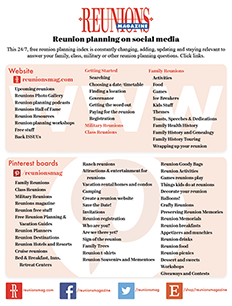 To help plan your reunion, call the Groups Department at 888-213-8216 or visit www.discoverycruise.com. If a cruise reunion sounds great but you haven’t the foggiest notion how to begin planning such an endeavor, Group Travel Consultants (GTC) may be your ticket to a fantastic get-together. The “Reunions at Sea” program focuses on the family reunion travel market, says John DeCrotie, GTC president and owner. “We work closely with clients to tailor the right cruise based on several factors including their budget, desired ports of call and cruise duration.” GTC considers the age range of your group to help determine which cruise lines have perfect amenities, activities and features. When you’ve targeted the right cruise, GTC does the heavy lifting of negotiating for additional discounts, proper cabin placement and upgraded amenities. They also provide custom flyers, ship information, ports of call and destination details and a private “Welcome Aboard” meeting. 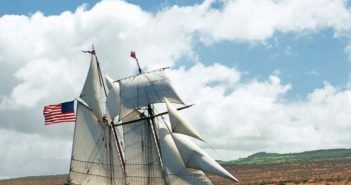 “Our program includes walking the reunion planner through the entire process and accompanying them on the ship to ensure they receive first-rate service start to finish,” DeCrotie explained. You needn’t fuss with arranging meeting space or private parties or setting up seating at meal times. When available, the GTC representative will have special welcome baskets in the cabins or start each family member with an on-board credit. One group leader from New York sat down with DeCrotie before she got on the bus to go home and told him, “The-pay-one-price-and-get-it-all concept has just amazed my family. When you said that all the food, meeting space, trip planning and accommodations were included, we had our doubts. But here we are off the ship after seven days and you were right. Everything you said was true and now I don’t need a vacation when I get home. Your company took all the stress out of moving over 90 people from New York around the Caribbean and back!” Give GTC your parameters, sit back and anticipate what could be the best reunion ever. Contact Group Travel Consultants at 800-829-8841 or www.GoGTC.com.